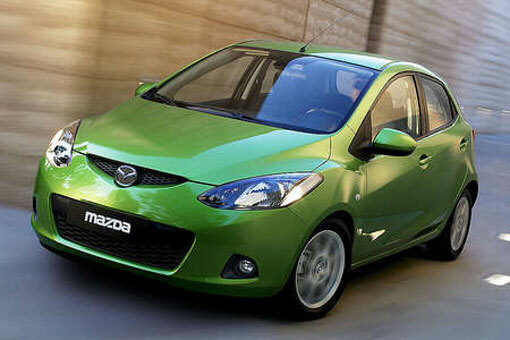 Mazda will launch its global subcompact, the Mazda2 five-door hatchback, in the US market roughly a year from now. Its first appearance in North America will be at December's 2009 Los Angeles Auto Show. Price is likely to be around $16,000. It is based on the same platform as the eagerly awaited 2011 Ford Fiesta, set to go on sale in the US next summer. Ford owned part of Mazda until it sold its stake this year to raise money, but the two companies will continue to develop cars together. 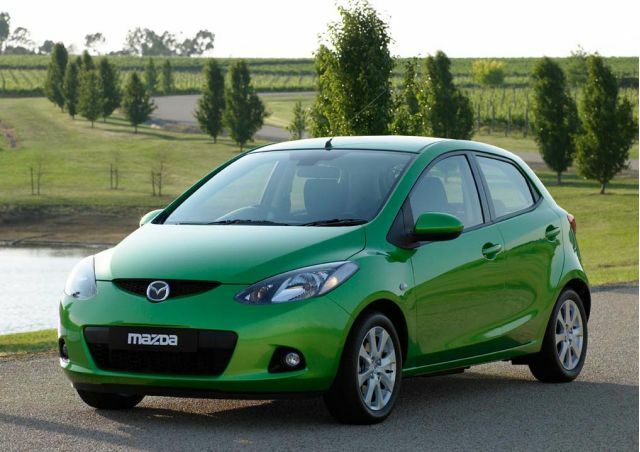 On sale in Asia and Europe since 2007, the Mazda2 subcompact is one car size smaller than its compact Mazda3. It will compete against a growing number of subcompacts, including the 2011 Fiesta, a completely redesigned 2011 Chevrolet Aveo, and the current 2010 Honda Fit and 2010 Toyota Yaris. 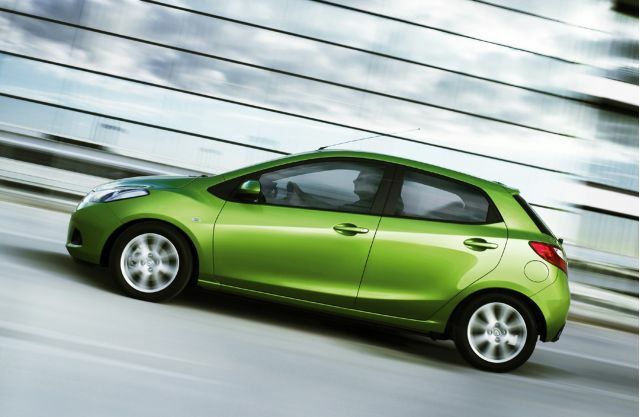 As a group, subcompacts rely on small size and small engines for fuel efficiency. Honda is the only one of the group to say it will offer a hybrid-electric car in this class; the hybrid Fit is expected within a couple of years. Mazda has no in-house hybrid technology in production, and is likely to acquire hybrid and electric car technologies from Ford, which has been selling hybrids since 2004. The car in these photos will be restyled for 2011, to add Mazda's characteristic "smile" front grille and bumper. The most extreme example of the style is the 2010 Mazda3. The interior shown here, which has been slammed for its looks and materials, is also likely to be redesigned. It will be fitted with a 1.5-liter four-cylinder engine and the choice of either a five-speed manual transmission or a five-speed automatic. In Europe, that engine produces 103 horsepower and accelerates from 0 to 62 miles per hour in 10.4 seconds. Figures for the US model will likely differ somewhat. 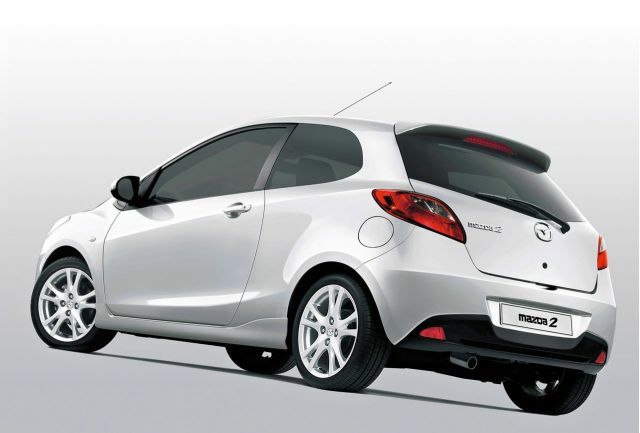 When it was launched in 2007, the Mazda2 (called the Demio in some markets) won kudos for a rare quality: compared to its predecessor, it was not only more capacious, more capable and better equipped, but at 2,200 pounds, fully 220 pounds lighter. 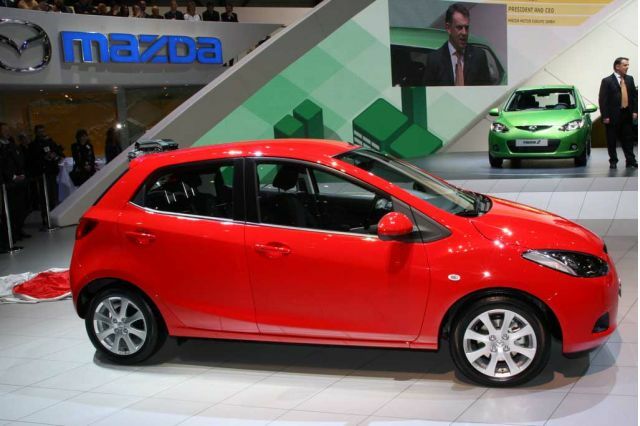 That weight reduction was one of the factors that led a panel of international automotive journalists to select the Mazda2 as the 2008 World Car of the Year. And weight reduction is one part of Ford's global "blueprint for sustainability" to improve energy efficiency: Make it lighter. After all, the heavier a vehicle, the more energy it takes to move it the same distance. The challenge in designing lighter cars comes in meeting crash standards--seven airbags, anyone?--and providing all the needed optional equipment, from navigation systems with in-dash displays to multi-speaker entertainment systems. For the Mazda2, the Mazda engineers used ultra-high-tensile steel and stronger welds to reduce the weight of the body structure while improving rigidity. It also improved the coefficient of drag to 0.32, a respectable number for a car less than 13 feet long.